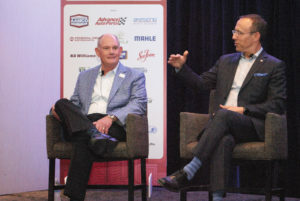 Canadian and Mexican aftermarket groups have both signed up with the Car Care Council to bring the “Be Car Care Aware” message to consumers across North America. The council signed an agreement with the Automotive Industries Association of Canada and the Asociación Nacional de Representantes, Importadores y Distribuidores de Refacciones y Accesorios para Automóviles, A.C. (ARIDRA) in Mexico to create Car Care Council North America . With 20 years of being a credible source for vehicle care, maintenance and repair, the council’s executive director Rich White sees the group being able to build the positive image and reputation it has built over that time. From left, Bill Hanvey, president and CEO of the Auto Care Association, and J.F. Champagne, AIA president, seen here at the 2018 Women’s Leadership Conference. For Mexico, it hopes such awareness of vehicle maintenance will help keep passengers safe in their cars and reduce collisions. “The creation of the expanded council seeks the unification of services in the United States, Canada and Mexico, to ensure that vehicles have preventive and not corrective maintenance. We intend to create consumer awareness to keep the vehicles in optimal condition,” said Alejandro Calderón, president of the 151-member ARIDRA, which includes manufacturers, representatives, importers and distributors of automobile parts and accessories. Car Care Canada has been around for years. How is this new?